Marin & Sylvia deliver ethical, full service results, based on 50+ combined years in real estate and over $200billion in career sales. Sylvia has been a top producing agent since 1973. She has served Presidential candidates, members of Congress, cabinet officials, governors, leaders in the arts, business, legal, non profit, and many professional communities. Her business is nearly 100% repeat and referral; a testament to her high ethical standards, strong negotiating skills, energy and discretion. Sylvia's daughter, Marin Hagen, joined her in 2007 and they are consistently the top producing team in the 100+ agent Georgetown office. Preview our listings online and we look forward to hearing from you. 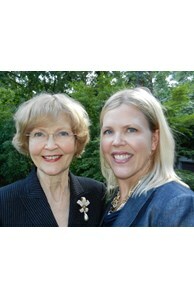 Sylvia & Marin have been Coldwell Banker's TOP TEAM in the Mid-Atlantic region for many years.